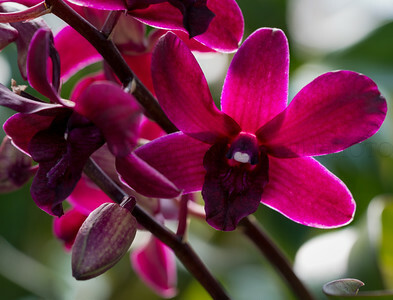 There are more than 30,000 orchid species. 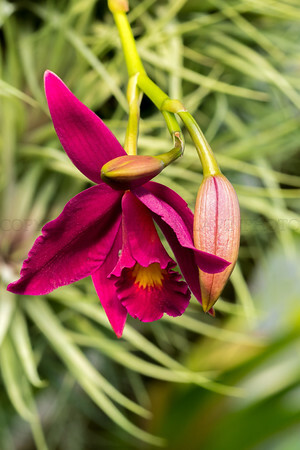 Bright crimson Orchid with geometricly shaped buds. 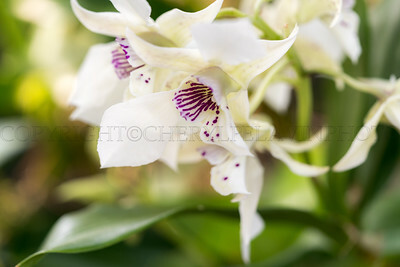 Orchid colored Orchids mounted and growing on a tree. 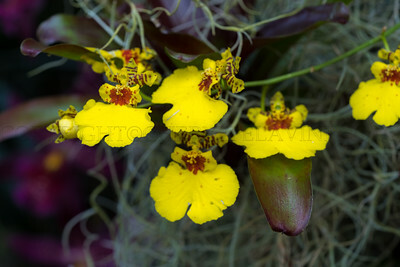 Daniel Stowe Botanical Gardens displays an annual exhibition of orchids and art. 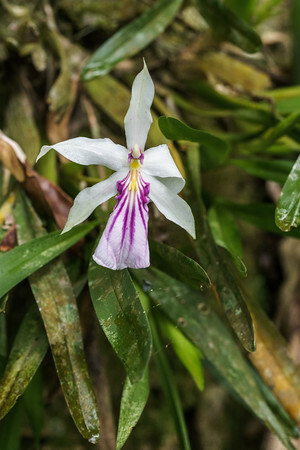 Gomesa Crispi orchid growing in the Atlantic Rainforest of Brazil. 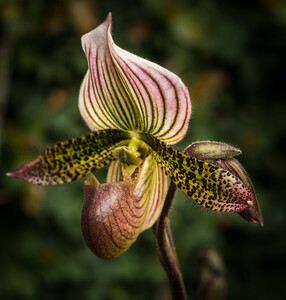 The orchid is like blown glass and of course, is casually growing in the forest like everything else in there. 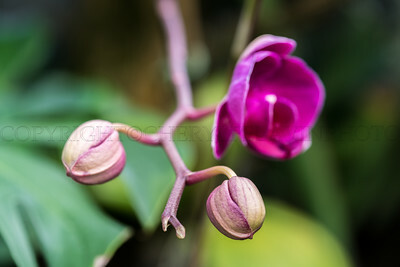 Rainforests are miracles of nature and we should be doing all we can to keep them intact. They are trying hard at REGUA. 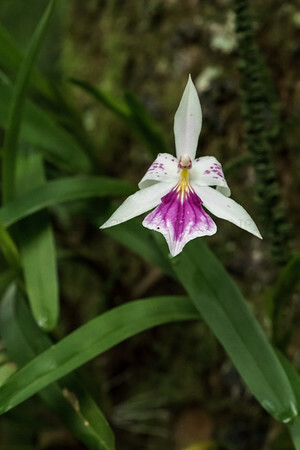 Catteleya Orchid growing wild in Brazilian Atlantic Rainforest. 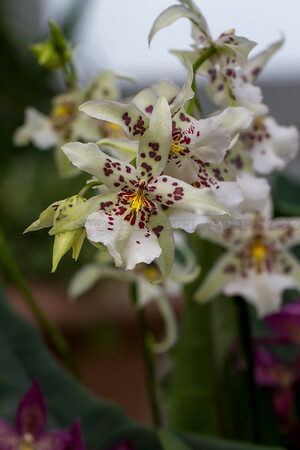 The only other place I've seen this orchid is in the Orchid Show at the Botanical Gardens in New York.see them living wild in a natural environment. 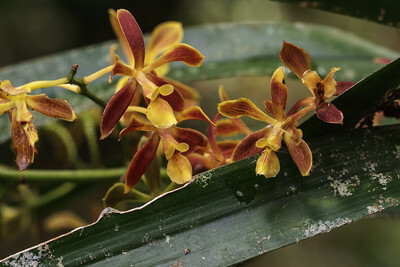 I get giddy knowing that orchids actually get to be a part of nature and not just a plant at the supermarket. 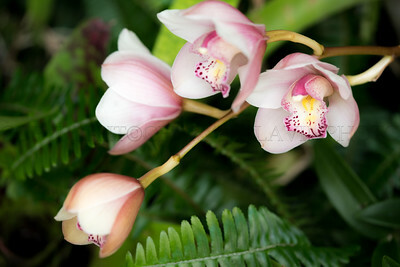 That is unfair, that is how I got my orchids, but still it is wonderful to see them in their own environment. 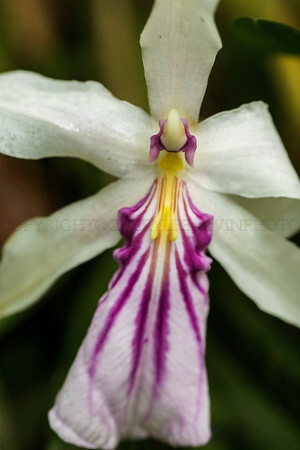 This is the habitat that produces this astonishing spectacle, out of all the wet green comes this startling white, yellow and magenta blossom. Another day when my group was out tramping around in the burning heat with their 500m lenses and I opted for a walk in the woods. 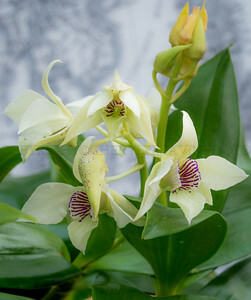 The only price I paid was listening to a few more strange conspiracy theories from the gentleman who led me to the orchid. 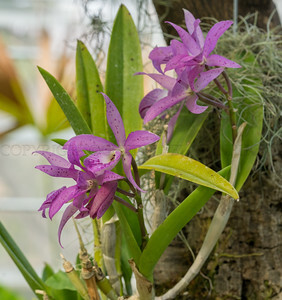 I could not believe my eyes when I saw this orchid growing on a tree that looked exactly like the set-ups in the New York flower show. All that bark and moss etc. 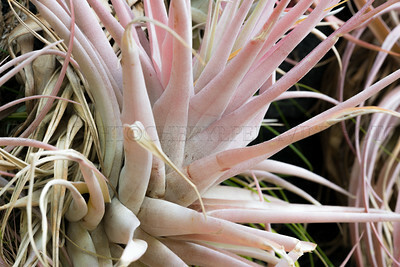 really exists and these things really do flower that way; in the jungle, wet and dark with a single ray of sunlight. The director of REGUA was present when I was whining that I cannot go out and hunt for small birds with my giant camera because I was hot and tired. 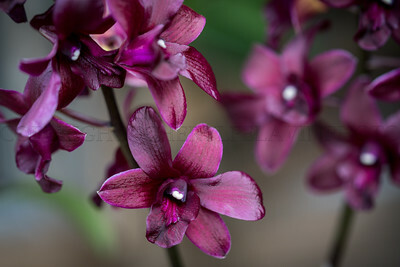 He asked if I like orchids. Yes, I do! 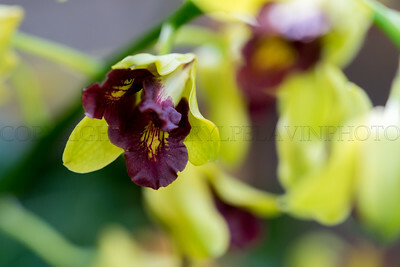 I was driven to a piece of the forest where he knew orchids were growing. 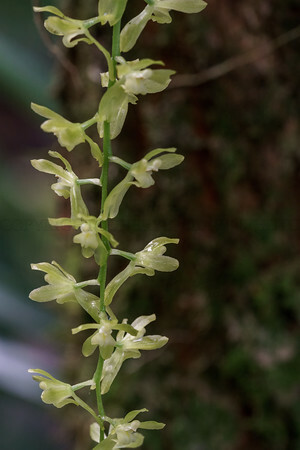 It was like being in magic land, all soft and green with shafts of sunlight filtering through the canopy. 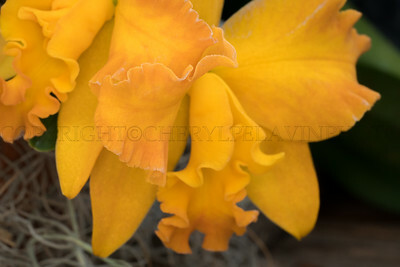 Right in front of me was this beautiful orchid, just minding it's own business. 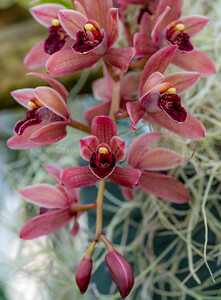 I had always thought that the presentations of orchids at the flower shows were over doing it, but that is how they look. 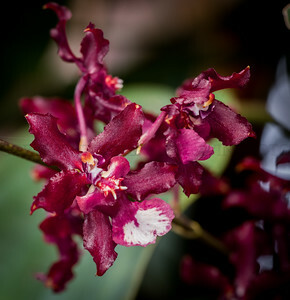 This orchid grows only in the eastern part of Brazil, although it is a now very popular with orchid growers. 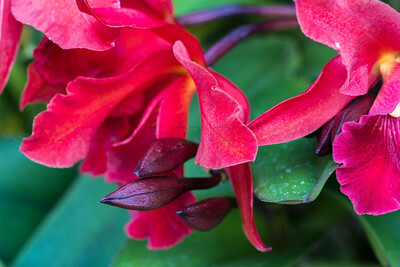 I believe this is called a "bi-color". 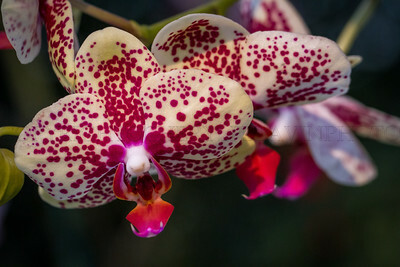 The loosely arranged, multicolored and oddly shaped spots on this orchid attest to nature's powers of seduction. and she knows no shame. 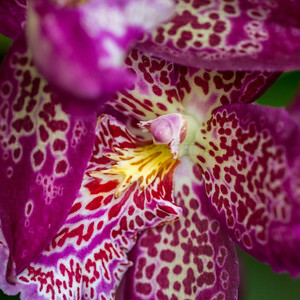 Thick wax like petals decorated with iridescence and wine colored spots make the viewer want to stroke the flowers.